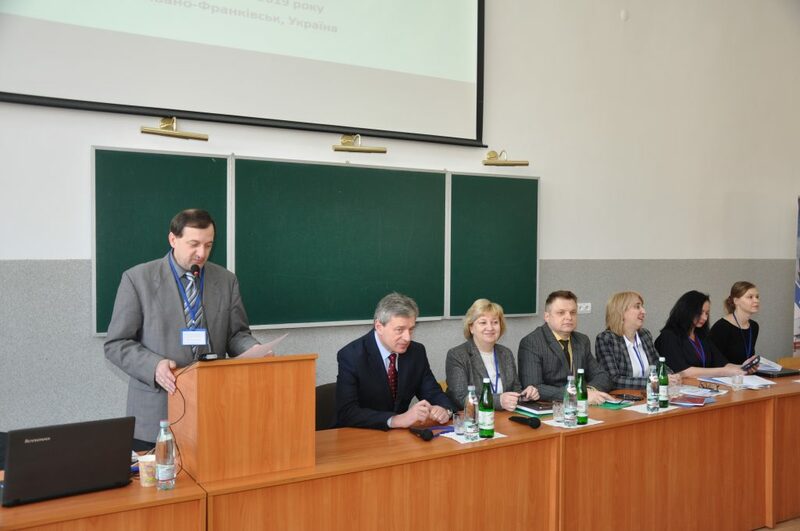 The International Conference TEACHING FOREIGN LANGUAGES IN UKRAINE AND BEYOND: BEST PRACTICES AND CHALLENGES was held on March 21-22, 2019 in Vasyl Stefanyk Precarpathian National University. It was jointly organized by English Philology Department of the Faculty of Foreign Languages of Vasyl Stefanyk Precarpathian National University, Institute of Pedagogy of the National Academy of Educational Sciences of Ukraine, Ivano-Frankivsk Regional Institute of Postgraduate Teacher Training Education, and All-Ukrainian Association of Teachers of Foreign Languages. The participants were from different parts of Ukraine and from abroad, namely from the USA, Canada, the UK, Poland, Moldova, Turkey, China, Vietnam, and Uzbekistan. The conference touched on the issues in foreign language teaching; foreign language teacher training specifics in the current social, economic and educational climate; conceptual foundations and practical aspects of undergraduate and postgraduate education, as well as continuing professional development of foreign language teachers, and shared their experience in training foreign language specialists with a view to implementing best practices in higher education institutions. The opening speeches were given by Ihor Tsependa, Rector of Vasyl Stefanyk Precarpathian National University, Doctor of Political Science, Professor, Nataliia Yatskiv, Dean of the Faculty of Foreign Languages, Candidate of Philology, Professor, and Yakiv Bystrov, Chair of the English Philology Department, Doctor of Philology, Professor. The participants listened to the plenary reports by Valerii Redko – Chair of the Department of Foreign Language Teaching at the Institute of Pedagogy of the National Academy of Educational Sciences of Ukraine, Doctor of Pedagogy (Competency-based Foreign Language Teaching at Comprehensive Secondary Schools: Current State, Challenges, Prospects), Iryna Zadorozhna – Chair of the Department of English Philology and Methods of Teaching English, Volodymyr Hnatiuk Ternopil National Pedagogical University, Doctor of Pedagogy, Professor (Issues and Trends in the Development of Foreign Language Teaching in Ukraine), Oksana Zabolotna – Professor at the Department of Foreign Languages, Pavlo Tychyna Uman State Pedagogical University, Doctor of Pedagogy, Professor (Learning and Teaching English as the Field for Constructing Meaning, Gaining Skills, and Getting Experience), Katerina Shlyamina – CELTA, ELT consultant, National Geographic Learning (Role Models in ELT). Ros Wright – Masters in ELT Materials Development, Medical English Specialist, (Netherfield, United Kingdom) and Todd A. Herring – Ph.D., AP World History teacher, Social Studies Division, Hefei No. 1 High School Sino-American Program; teacher of English (Hefei, People’s Republic of China) gave their presentations The Competitive Edge: Supporting Trainers in Soft Skills Development and Using ‘Habits of Mind’ and Foreign Language Film in the ESL Classroom as Effective Teaching Approaches respectively via video conference. The participants also took part in 4 panel discussions, 6 workshops and 6 demo lessons.